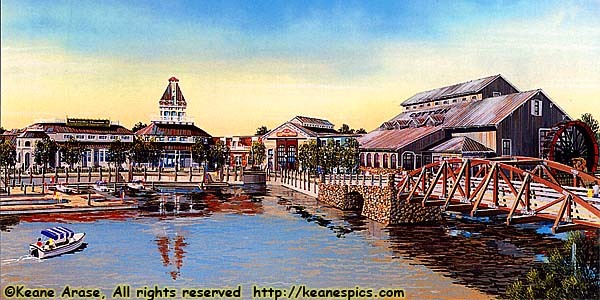 Port Orleans - Riverside, a resort themed after the mansions and bayous of the deep south. Disney's Port Orleans Resort is composed of two, formerly separate resorts, located in the Downtown Disney area. The original Port Orleans, is now known as Port Orleans - French Quarter (POFQ); and the original resort Dixie Landings, is now Port Orleans - Riverside (POR). Understand that they are two different resorts operating under the umbrella name "Port Orleans". Port Orleans - French Quarter doesn't have a table service restaurant (You have to take a walk to Riverside for table service), but it has it's own registration desk (you cannot register for a room at Riverside from French Quarter), food court, arcade, gift shop and bar. It is, down to the theme, a completely different resort than Riverside. End Port Orleans - Overview.